If you've been struggling to find handyman services Ealing that you can rely on... look no further! 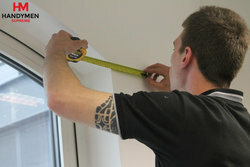 Handymen Supreme gives you reference-checked and experienced handymen armed with the latest tools. Covering all of the local area, North London, and other locales too, you can get the same friendly, professional service as thousands of other local people. To ensure yourself in the quality of our services, visit our testimonials page and learn what previous customers think about us. Here you'll find the experts you need for home repairs like plumbing and electrical work, painting and decorating, hanging and mounting, and much more! Talk to us about why you need a handyman Ealing at any time - we're open 24 hours a day! High quality, reliable results every time - just ask our previous clients! What Do We Offer Local Residents? Odd Jobs - get help with all of those little fix-up and DIY tasks that have been piling up with one handy service to take care of it all. Furniture Assembly - tired of hard furniture assembly instructions? Let the supreme professionals do the work for you! Interior Painting - a variety of water-based, speciality and solvent-based paints make our interior painting service the ideal one for any surface. The Ealing decorators we work with can handle even the most challenging decorating jobs! In addition, you can count on highly trained painters in Ealing too! TV Wall Mounting - mount and fix all sort of equipment to walls, including speakers, amplifiers and televisions. Hanging and Fitting - hang or fit curtain rails, shower rails, all sorts of shelving, pictures, mirrors - this service does it all. Worried about how much your handyman services in Ealing are going to be costing you? Many of our clients are - that's why we've instituted our hourly-based payment system. This way you'll always know exactly how much you've spent at any given time. It's worth bearing in mind that all of our previous clients have benefited from the quality of our services, and the full insurance cover we provide. That's why so many landlords, tenants, property agencies and property owners use our services. Book Now - Your Service Awaits You! Calling 020 3746 5607 is the quick and simple way to set up your booking, but you can also quickly use our chat feature or our booking form here on our website to make your enquiry. Book a handy man Ealing now! We'll need a little information to make sure your booking goes smoothly though - firstly regarding the job you've got in mind so that we send the right person for the task at hand. You can choose your appointment time from our seven day-a-week availability range. Primarily in West London, but a little bit northerly too, Ealing contains the wards of Ealing Broadway and Ealing Common. The borough of Ealing is probably best known for its film studios, where such movies as Notting Hill and The Importance of Being Earnest, as well as the classic Monty Python's Flying Circus were filmed.